The Oracle of Omaha has a fantastic track record when it comes to predicting bad financial outcomes. Warren Buffett, like several other notable billionaire investors, has been an extremely harsh critic of bitcoin and other cryptocurrencies. In January 2018, the Berkshire Hathaway (NYSE:BRK-A) (NYSE:BRK-B) CEO said that "I can say with almost certainty that [cryptocurrencies] will come to a bad ending," and that if he could, he would gladly buy a five-year put option on every single cryptocurrency in the market. And, at Berkshire's annual meeting in May, Buffett doubled down, calling bitcoin "rat poison squared." Cryptocurrency enthusiasts have been dismissive of Buffett's criticism, but I'd advise them to be careful. You may be surprised at how accurately Buffett has predicted some of the biggest investment meltdowns of the past few decades. In April 2000, there were signs that the dot-com boom was cooling off. Tech stocks were down about 20% from their all-time highs after a few years of incredible gains. However, many people thought this was just a simple correction and continued to load up on dot-com stocks. Not Buffett. At Berkshire's annual meeting that year, he and his right-hand man Charlie Munger were asked about the speculation in internet-based businesses. Buffett said that it would eventually come to an end. "In the end, the only wealth creation comes about from what the business creates," Buffett said. "Investors can't be richer as a group unless the company makes them richer." His problem wasn't with internet technology, which he and Munger never denied was a game-changer. Rather, Buffett thought the valuations for which many dot-com stocks were trading were simply ludicrous. "In the end, valuation does count," Buffett said. "When you get a huge number of participants playing with ever-increasing sums, it creates its own apparent truth. It can be for a considerable amount of time, but it won't go on forever." He was right. 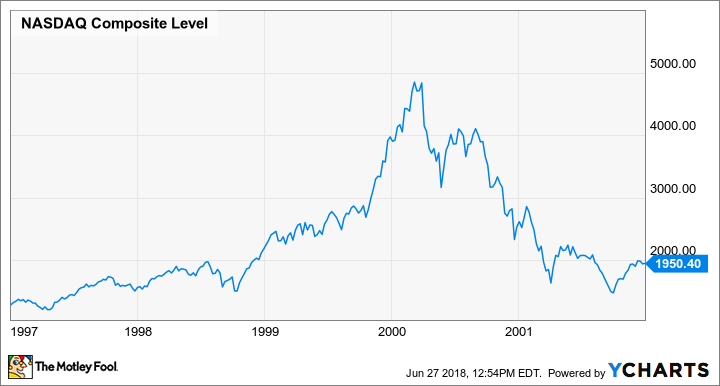 By the beginning of 2002, the Nasdaq Composite had fallen to less than half of its level when Buffett made his comments. Derivative securities have existed for some time, but their popularity really surged in the early to mid 2000s. In an unprecedented move in 2003, Buffett actually pre-released a portion of his annual letter for publication in Fortune magazine to warn the industry about the dangers of derivatives, which he referred to as "financial weapons of mass destruction." Charlie and I think there is a low but not insignificant probability ... that derivatives could accentuate in a major way some systemic problem that might even arise from some other phenomenon. And we think that's inadequately recognized. We think the problem grows as derivatives get more complex and as their usage increases. This is almost exactly what happened during the financial crisis. Another phenomenon (in this case, easy mortgage lending) was made far worse by complex derivative securities, and it nearly caused the collapse of the U.S. financial system. Speaking of easy mortgage lending, Buffett was an outspoken critic of the mortgage industry and the housing price bubble in the years leading up to the financial crisis. He attempted to warn people several times that things were going to get bad. At Berkshire's 2005 annual meeting, Buffett said, "If you keep marking up something [housing], and in the process, the payment for the marked-up price comes from someone else who feel they are bearing no risk because they have the government guarantee in between, the money can just flood in, and everybody feels very happy for a long time." Well, a few years later, there were signs that things were starting to turn. Home prices stopped rising, and foreclosures began to increase, but it was nothing compared to what was coming. At Berkshire's meeting in May 2007, Buffett said about the housing market, "You'll see plenty of misery in that field." I think that's dumb lending, and I think that's dumb borrowing. Someone who can only make 20% to 30% of their normal mortgage payments in the first year is very unlikely to be able to make 110% of their normal mortgage payments a few years later. Those people and those institutions were largely betting on the fact that housing prices would just keep going up, and it really didn't make any difference whether they could make the payments. And that worked for a while until it didn't work. One thing Buffett may have underestimated is just how much of an effect the housing market would have on the overall U.S. economy. "The question is whether it spills over and starts affecting the general economy to a big degree," Buffett said. "I think it's unlikely that that factor alone triggers anything of a massive nature in the general economy." He was right in the sense that housing alone wouldn't cause the financial crisis. It was a combination of bad lending practices and creative derivative securities that he warned about just a few years prior. To be clear, I'm not saying with 100% certainty that Buffett is right about bitcoin and other cryptocurrencies. He is wrong sometimes, too -- he recently admitted that he completely missed the boat on Amazon.com, for example. Rather, my point is that it can be dangerous to dismiss Buffett's warning as just "an old guy who doesn't get it." Buffett may not understand bitcoin or the technology behind cryptocurrencies, but he does understand concepts like bubbles and irrational investor behavior, and has made boatloads of money because he understands them so well.